Comic book fans have been itching for a decent big screen incarnation of popular anti-hero, Venom, ever since before the ill-advised Spider-Man 3 failed to do the character justice back in 2007. The idea of a morally ambiguous "hero" who essentially has multiple personalities (in the form of an alien "symbiote" inhabiting his body) is undeniably appealing. It has been 11 years since the character was last seen on screen, and Venom billed itself as the film fans have been waiting for. Starring Tom Hardy as the titular anti-hero, Venom attempts a fresh take on the character that only works thanks to Hardy's delightfully off-kilter performance, while the film around him flounders in tonal confusion. R-rated superhero movies have proven their viability with Deadpool and Logan, and if ever a superhero movie needed to be rated R it's Venom. Venom snacks on bad guy's heads, discusses eating their eyes, lungs, and brains, and generally wreaks bloody havoc on anyone who stands in his way. The problem is almost all of this happens off-screen. Venom is a bloodless PG-13 spectacle that is so clearly pulling its punches that it's hard to take it seriously, as it aims right down the non-offensive middle in an attempt to broaden its mainstream appeal. The result is a weak, toothless affair that ends up pleasing no one in its attempt to please everyone. 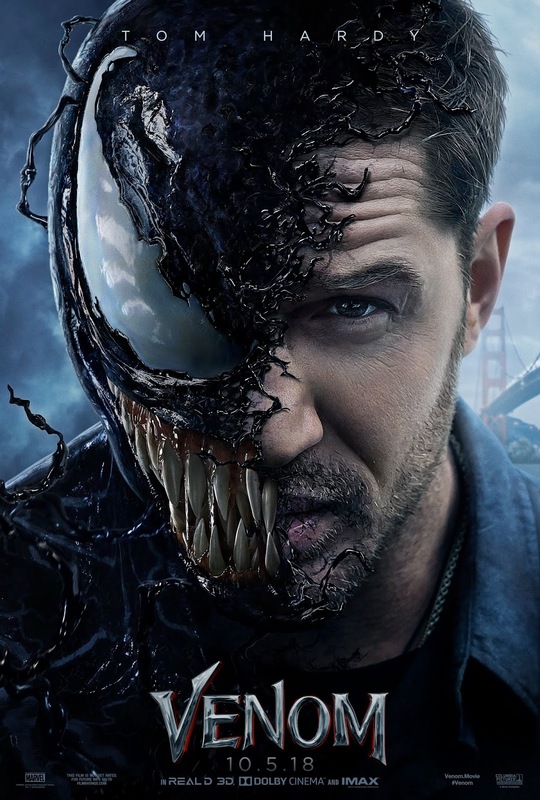 The humor is awkwardly placed, the action scenes are frenetically cut in order to edit around the carnage, and in the middle of it all Tom Hardy is having a blast a mild-mannered reporter Eddie Brock and his destructive alter-ego. Hardy's performance demonstrates what the film could have been with a better script and more cohesive direction, the odd blend of lame humor and dark, vengeful action never really allowing the film to have a personality of its own. Venom is clearly Sony's attempt to do a film similar to the Marvel Cinematic Universe. And while Venom is indeed a Marvel Comics character, Sony's endeavor to emulate Disney's successful Marvel formula feels strangely dated, feeling more like the glut of cartoonish, blue-tinted superhero movies like Daredevil and Fantastic Four that littered the multiplexes in the early 2000s. It's a grave miscalculation for a character as dark as Venom. And while the character design is far superior to the 2007 take on the character, nothing in Venom is as interesting as anything Sam Raimi attempted in the original Spider-Man trilogy. It's a surprisingly generic, listless film (even down to the strangely anonymous score by Ludwig Göransson, fresh off the success of the vastly superior Black Panther earlier this year), filled with poorly rendered CGI effects and painfully tin-eared dialogue that doesn't do its cast any favors. Hardy is enough to give one hope for future films (despite a mid-credits stinger featuring Woody Harrelson in a ghastly wig), but unless Sony truly embraces the darkness of a potential face-off between Venom and his serial killer arch-nemesis, Carnage, then this franchise is already dead on arrival. VENOM | Directed by Ruben Fleischer | Stars Tom Hardy, Michelle Williams, Riz Ahmed, Jenny Slate, Scott Haze, Reid Scott, Michelle Lee | Rated PG-13 for intense sequences of sci-fi violence and action, and for language | Opens today, 10/5, in theaters nationwide.